Hotel venues are always a great place to host a classic, formal wedding ceremony. Locations such as the Hyatt Regency in Vancouver, British Columbia have beautiful areas designated for couples to exchange their vows. Creating a romantic and polished setting for the bride and groom to stand in front of their friends and family takes creativity and thought. Changing a room can be done with a wide range of décor and furnishings. At this venue, the backdrop has been made more interesting using pleated, white curtains and creative lighting. 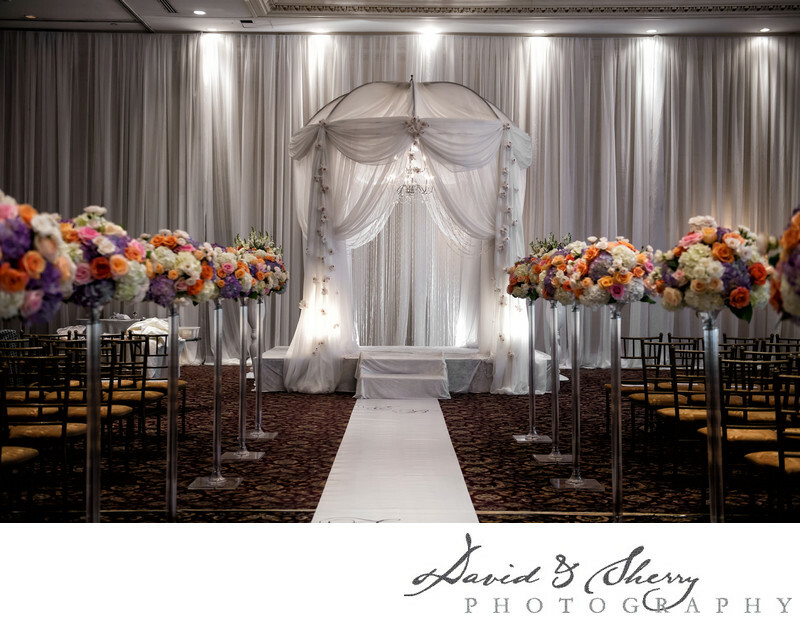 The arbour is elegant and unique with draped material and hanging white flowers on each side, making a perfect frame for the bride and groom to stand beneath. The tall floral arrangements along each side of the aisle provide a simple and luxurious path for the bride to be escorted down. The Hyatt Regency in downtown Vancouver provides these beautifully decorated spaces for large events. Whatever the culture or tradition may be, the staff caters to the needs of the bride and groom and their family in order to make the day unique and designed for them. To learn more information about the Hyatt's services in BC’s most beautiful city, go to their website at www.vancouver.regency.hyatt.com. Location: 655 Burrard St, Vancouver, BC V6C 2R7.